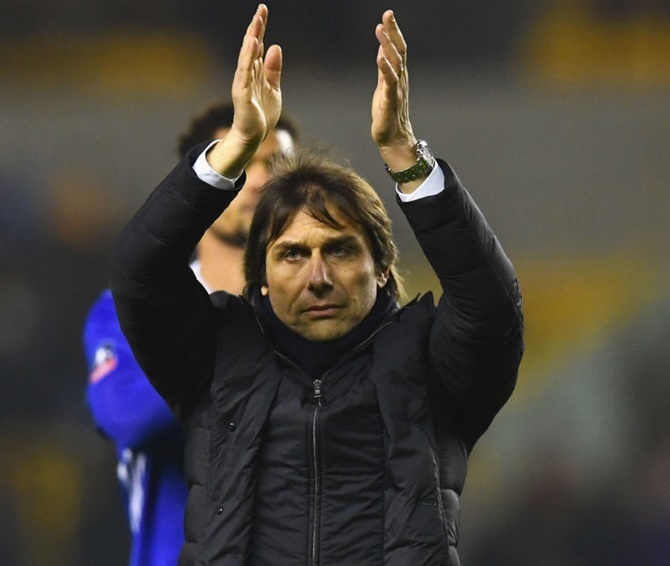 Chelsea manager Antonio Conte paid tribute to the performances of his back-up players as his in-form team moved a step closer to a league and cup double. The Italian made seven changes for Saturday's FA Cup fifth-round tie at second-tier Wolverhampton Wanderers, which the Premier League leaders won 2-0 thanks to second-half goals from Pedro and Diego Costa. With Chelsea eight points clear in the Premier League and with at least two sides from outside the top flight having reached the FA Cup quarter-finals, the Londoners' chances of a second domestic trophy double in seven years look good. Conte said it was too early to be thinking about the "double", although he acknowledged to reporters his team were doing "a great job" in both competitions. "But after this game it is important to understand that nothing is easy," he said. "It will be very difficult to win both competitions, but we want to try to win some trophies." With 13 league games remaining -- including matches against both Manchester City and Manchester United -- Conte knows he will need positive contributions from all his squad. He was pleased with the performances of those he called up for the tricky encounter with Wolves, including Cesc Fabregas and former captain John Terry, who have become fringe players under the former Italy head coach. "Don’t forget today I made seven changes and I trust in my squad and my players," he said. "It's important that when I put them in the starting 11 that I have a good reply from my players who are not playing a lot. Today they give me great answers. "It is not easy when you don’t play a lot, and John and Cesc and all the players showed me they have good form. It means they are good professionals. It is great to have these type of players in my squad because I can count on them." Young squad players Nathan Ake, Kurt Zouma and Nathaniel Chalobah also made rare starts, while Pedro scored for the third FA Cup tie in succession, playing in an unfamiliar wing-back role. "I am pleased for Pedro, for the team, and now we must continue in this way," Conte added. Conte said Wolves presented his team with their most difficult FA Cup tie so far this season, following their 4-1 win over third-tier Peterborough United and a 4-0 success against Brentford, who are four places above Wolves in the Championship. "I like to repeat that in England in every game in every competition there does not exist an easy game," said Conte.